Thank you to each and every one of our guests who added a review of their stay during our 2018 season (and indeed, all those in previous years too!). 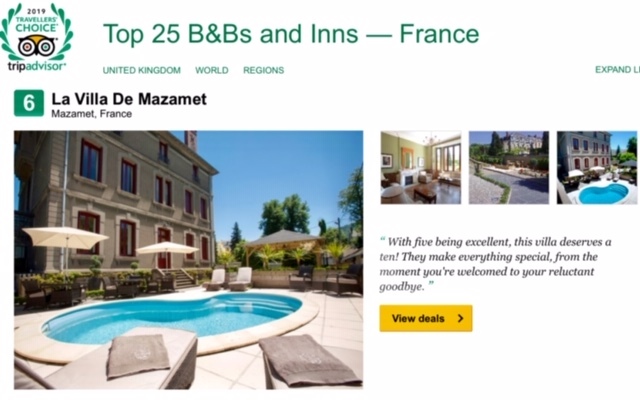 No other B&B in France has won a Traveller’s Choice award in so many successive years. For 2019, La Villa is rated as the No. 6 B&B in the whole of France which is a major accolade for us as we near the start of our 11th season. With so many new B&Bs opening across the country since we commenced in 2009, we are humbled that La Villa as been rated in the top 10, of more than 10,000 B&Bs, for 9 consecutive years. Thank you for your continued support. Please visit our Trip Advisor page to read our reviews – or perhaps add your own if you have not had to as yet.